NES Ironsword: Wizards & Warriors II (USA) in 07:14.32 by Aglar, Randil, Alyosha, rchokler, Samsara. The valiant knight Kuros, who has now grown eyeballs on the outside of his helmet, must again fight off the evil wizard Malkil. This task is accomplished mainly by finding an artifact in every level, giving it to a corresponding oversized animal to get into the level boss' lair, and promptly beating him up with a level-specific attack spell. 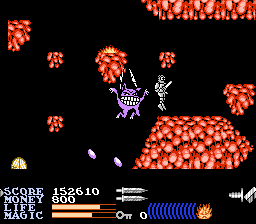 However, this run manages to use a glitch to keep the attack spell for several levels instead of losing it at the level's end. This is an improvement of 1 minute and 14.41 seconds over the previous TAS, thanks to much better optimization. The final boss fight was especially improved thanks to a frame war between several of the authors.